WALLOPS ISLAND, Va. -- An Orbital Sciences Corp. Antares rocket making only its fifth flight exploded seconds after launch from the Virginia coast Tuesday, erupting in a spectacular fireball and destroying an uncrewed Cygnus cargo ship in a disheartening failure for NASA's commercial space station resupply program. The mishap occurred about 15 seconds after liftoff from the Mid-Atlantic Regional Spaceport at NASA's Wallops Island Flight Facility as the 139-foot-tall two-stage rocket climbed away on the power of its two Russian-built first-stage engines. "We have ignition... and we have liftoff of the Antares Orb 3 mission to bring Cygnus on its third (resupply) mission to the ISS," said NASA's launch commentator as the Antares lifted off. "Main engines at 108 percent, attitude nominal." At roughly that moment, the exhaust plume suddenly intensified, followed an instant later by a detonation of some sort at the base of the rocket. The booster, engulfed in flames, then slowly fell back to Earth, exploding in a titanic conflagration as its remaining liquid oxygen and refined kerosene propellants ignited in a huge fireball. At impact, flaming debris shot away into the night sky like a fireworks display, some of it presumably from solid propellant used in the rocket's second stage. Scattered fires erupted around the launch pad and a towering cloud of smoke climbed into the night sky. While property damage appeared extensive, Orbital officials said there were no injuries. It was not clear watching video replays of the launching what might have gone wrong, whether it involved one or both Aerojet Rocketdyne AJ26 first stage engines or some other system. An AJ26 engine being test fired last May for an Antares flight next year suffered a catastrophic failure 30 seconds into a planned 54-second burn. After a detailed failure investigation, Orbital managers cleared the powerplants for use in downstream missions based on corrective actions implemented in the wake of the failure. Frank Culbertson, a former shuttle commander and space station crew member who serves as Orbital's executive vice president, said engineers had not yet had time to examine telemetry in any detail and "we don't know whether the engine was involved in this or not. That's something we'll try to determine as quickly as possible." The rocket's self-destruct system apparently was triggered at some point, but Culbertson said he did not yet know the timing of the events or how that might have contributed to the rocket's breakup. He warned the public not to pick up any debris that might be found in the area, saying unburned propellant could pose a threat. In any case, the loss was a major setback for Orbital's plans to establish routine space station access under a $1.9 billion contract with NASA calling for delivery of 20 tons of hardware over at least eight flights through 2016. It also marked a major setback for the space station program, which is attempting to fill in the void left by the space shuttle's retirement, using commercially developed cargo ships to carry supplies and equipment once carried by the manned orbiter. More than 5,000 pounds of cargo and supplies, including research hardware, student experiments, spare parts, food and crew supplies, 32 small nanosatellites and other gear, were lost in the mishap. "It's a tough time to lose a launch vehicle like this and it's payload," Culbertson said. "It's not as tragic as losing a life, and so we're very happy to report there were no injuries ... and all we lost was hardware. "That hardware, however, is very important and very high value to the company and to our customers. Our team worked very hard for this mission. However, something went wrong and we will find out what that is. We'll determine the root cause, and we will correct that, and we will come back and fly here at Wallops again, hopefully in the very near future." Mike Suffredini, NASA's space station program manager at the Johnson Space Center in Houston, said nothing critical was lost in the mishap. "As a program, of course, we manage the station to protect for just such an event should it occur," he told reporters in a post-flight news conference. "Therefore, we keep logistics on board the ISS to protect us for about four to six months in the event other logistics vehicles can't make it to ISS. So in fact, our logistics on board today, if no other spacecraft showed up, takes us well into next year. So from a consumables standpoint, we're in good shape." He said NASA would work with researchers to get experiment hardware rebuilt and relaunched while assembling more spare parts to replace components lost in the accident. "But the station's in great shape, the crew's in good shape, we've got plenty of work for them to do on orbit and plenty of supplies on orbit to keep them going for quite some time," Suffredini said. "So while this event is very unfortunate, we will support the Orbital team as they work through their anomaly and continue to operate station well into the next several months while we wait for Orbital to return to flight." Orbital's Antares/Cygnus cargo vehicle is one of two resupply systems funded by NASA in the wake of the shuttle's retirement. Space Exploration Technologies, or SpaceX, holds a $1.6 billion contract for at least 12 missions to deliver 44,000 pounds of cargo to the station. SpaceX's Falcon 9 rocket and Dragon cargo ship remain operational, with the next two resupply flights planned for December and February. "Sorry to hear about the @OrbitalSciences launch," SpaceX founder and chief designer Elon Musk tweeted. "Hope they recover soon." The Russians, meanwhile, launched a Progress supply craft from the Baikonur Cosmodrome in Kazakhstan on Wednesday. 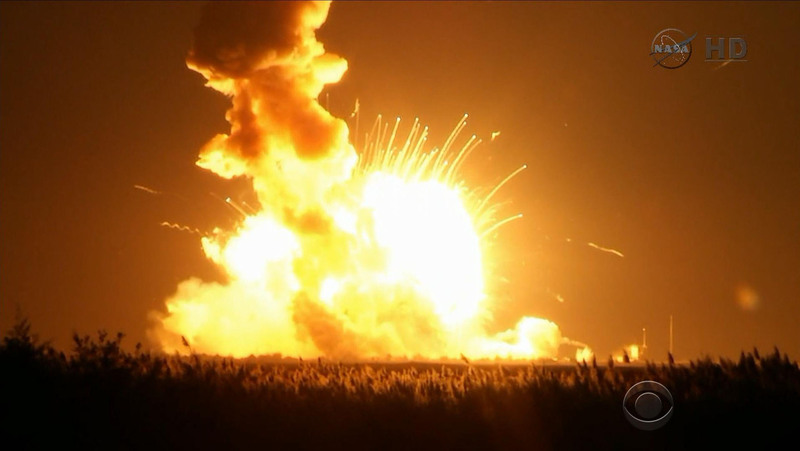 How the Antares failure might impact NASA's resupply strategy in the near term is not yet known. While a high-pressure nitrogen tank needed to top off tanks in the station's Quest airlock was lost with the Cygnus, the station is not expected to suffer any immediate problems. "While NASA is disappointed that Orbital Sciences' third contracted resupply mission to the International Space Station was not successful today, we will continue to move forward toward the next attempt once we fully understand today's mishap," Bill Gerstenmaier, NASA's chief of space operations, said in a statement. "Orbital has demonstrated extraordinary capabilities in its first two missions to the station earlier this year, and we know they can replicate that success. ... Today's launch attempt will not deter us from our work to expand our already successful capability to launch cargo from American shores to the International Space Station." The next Antares/Cygnus mission is currently planned for April, but that flight could be delayed pending the results of an investigation into the failure Thursday. Tuesday's launching went off on time at 6:22 p.m. EDT, roughly the moment Earth's rotation moved the pad into the plane of the space station's orbit. After a final round of computer checks to verify the first stage engines were working properly, the Antares was released from its launching stand at the Mid-Atlantic Regional Spaceport and the rocket began climbing away. The initial seconds of the ascent appeared normal as the booster climbed straight up, its first stage engines burning oxygen and RP-1 kerosene rocket fuel. But just 12 to 15 seconds or so after liftoff, a catastrophic failure occurred, appearing to originate at the base of the rocket. "What we know so far is pretty much what everybody saw on the video," Culbertson said. "The ascent stopped, there was some, let's say, 'disassembly' of the first stage, it looked like, then it fell to Earth. "We don't have access to all the data yet because of the way the accident investigation proceeds. We lock it all down and then we go through a very methodical process to recreate that data and evaluate it. So we don't have any early indications of exactly what might have failed, and we need some time to take a look at that, from a video and telemetry standpoint." The AJ26 first stage engines originally were developed for the Soviet Union's ill-fated N-1 moon rocket. When that program was cancelled after multiple launch failures, the engines were put in storage. In the 1990s, Aerojet Rocketdyne bought about 40 of the powerplants and modified them for use aboard U.S. rockets. The May 22 test failure "obviously sparked a very thorough investigation led by Aerojet Rocketdyne, our engine supplier, supported fully by Orbital with a lot of help by NASA," Mike Pinkston, Orbital's Antares program manager, said before the company's third resupply flight in July. "That was a lengthy process." While details were not provided to the media, the engines used in July and in Tuesday's launching were subjected to exhaustive pre-flight checks and tests to make sure they were healthy and ready for flight. "It's an extensively tested engine that is very robust and rugged and it goes through extensive testing by a team at (NASA's) Stennis Space Center before it's ever installed on the rocket and used as the powerplant," Culbertson said. "These engines were taken through the normal acceptance testing and pressure testing, etc., both at Stennis and here at Wallops prior to the launch. We didn't see any anomalies or anything that would indicate there were problems with the engine."